SEOUL, Oct. 9 (Yonhap) -- North Korean official media made known Monday the list of the country's power elite through its VIP seating arrangement at a national event for the North's late leader Kim Jong-il. The Korean Central Broadcasting Station and the Rodong Sinmun newspaper, announced the names of a 25-man group on the VIP stage of the "Juseokdan". The event, held Sunday, was to celebrate the 20th anniversary of Kim Jong-il, the current leader Kim Jong-un's father, being elected as general secretary of the Workers' Party of Korea. In the reports, President of the Presidium of the Supreme People's Assembly Kim Yong-nam topped the list followed by Choe Ryong-hae, a vice chairman of the country's ruling party, who is seen as being on the rise. The two were trailed by Premier Pak Pong-ju and Hwang Pyong-so, director of the general political bureau of North Korea's armed forces. Previously, the North's official media had the names in the following order: Kim, Hwang, Pak and Choe. At the event, Choe was named ahead of Pak and Hwang, while Pak was mentioned before Hwang was introduced. 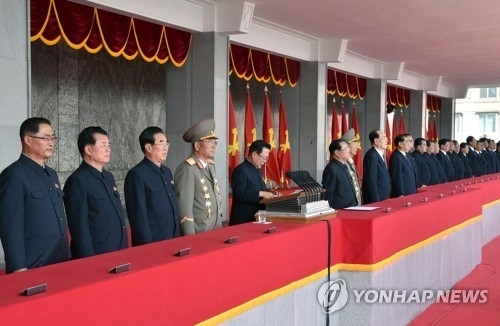 The order in which the North's senior members were announced also gave a glimpse into power shifts in the country's elite, coming shortly after a plenary meeting of the Central Committee of the Workers' Party of Korea, held Saturday for the first time since May last year. Juseokdan refers to a VIP stage at North Korea's public events that is made differently from the seats for general participants. Senior members of the North's party, government and military circles are given positions based on their standing, with seating positions away from the Juseokdan's center and first row indicating a lower rank. In North Korea, Choe and Pak represent the party and the economy, respectively, said Kim Yong-hyun, a professor of North Korean studies at Seoul's Dongguk University. "Through the plenary meeting, Kim Jong-un showed his willingness to concentrate power in the party and give more importance to the economy." Kim's move to give more precedence to Choe and Pak, who have accompanied Kim on his trips to locations related to the economy, over Hwang, who represents the military, is also interpreted as a message that he will manage the difficult economic situation amid the international community's efforts to denuclearize North Korea through sanctions. During the Saturday meeting, Choe, known to be one of the closest aides to leader Kim Jong-un, was picked as a member of the party's powerful military commission. Four out of the party's nine vice chairmen -- Kim Ki-nam, Choe Tae-bok, Kwak Bom-gi and Li Man-gon -- failed to make appearances at the VIP stage, indicating they have withdrawn from their positions. Six new vice chairmen were named: Pak Kwang-ho, Pak Tae-song, Tae Jong-su, Pak Tae-dok, Ahn Jong-su and Choe Hwi. Kim Yong-hyun said the absence of the four, including aged members like Kim Ki-nam and Choe Tae-bok, is seen as a shift in generations, adding that "the replacement of the party's vice chairmen who are involved in making decisions for domestic and foreign policies is expected to bring about a big change in the North's policy direction." The emergence of Pak Kwang-ho, who has hardly featured in North Korean news reports until now, as the host of the Sunday event is also drawing media attention in the South. Pak was named a member of the party's political bureau, a vice chairman of the party's central committee, and chief of a department of the committee all at once during the latest party plenary meeting. Since little is known about him, North Korea watchers are wondering why he has been skyrocketed to the center of power and if he will come to take an important role in the party.